An effective way to conduct Games for Evaluation (GFE) is through electronic or physical board games. 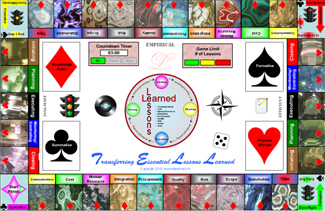 This site hosts electronic board games built in Flash that supports advanced learning concepts. The game design is very robust and can support a full-day team building activity. Boards are customized to the industry type. The online example is information technology generic. Contact us for application specific board designs. They can be created quickly for your learning pleasure. The objective of a simulation is to emulate real-life conditions when using LL Support Systems or Repositories. This is necessary because PTMs and stakeholders must be comfortable with the features and functionality. The powerful open architecture of software applications must be focused so that subscribers understand what to use and what does not apply to their Standard Operating Environment (SOE). There is a paradigm shift in thinking of how to effectively train on LL support systems and repositories as compared to other applications, i.e., MS Office. For example, a General Subscriber i.e., stakeholder or sponsor may attempt to maximize their understanding of all the options in PowerPoint. Comprehensive understanding may be desirable because the GS wants to be a presentation guru. This perspective is wonderful and should be encouraged. On the contrary, when a GS will be accessing programs such as MS Project and MS SharePoint, the options are extensive and customization may be required. So from a GS perspective, understanding every function is necessary. This is because a specific user may only need to contribute or view a lesson. This being said, simulations must be built for specific audiences. Advanced training will of course be required for PTMs (who may be the system admnistrators). A simulation should address what each group of users should do in a system to complete a task. For a GS, the rule is to be concise and simple. On the other hand for PTMs, the simulation must be detail oriented . Remember the goal is to encourage use of the LL support system or repository for GS while equipping PTMs. People are 600% more likely to learn something when it is enjoyable because it is memorable. So the Instructional Systems Design (ISD) can incorporate appropriate fun and humor through active engagement. What you do not want is a simulation that is dry, dull and boring that people simply click through. A role play is an outlined discussion between two or more people to increase comfort in the areas of research, measurement and evaluation, which are core, common and critical to PE. A typical role play scenario will involve one PTM acting as the client and the other PTM acting as an evaluator. The intent of the role play is to practice what is going to be said to the client before the PTM meets with them. A rehearsal increases the level of evaluation quality because it is essentially the creation of a script. An important consideration is for each PTM to have training in qualtiative and quantitative research concepts. They should also be familiar with research protocol, coupled with an comprehensive understanding of measurement and evaluation. The project lead must do what they can to ensure there are controls in place to ensure professionalism in PE for all PTMs. If controls are not in place for PTMs, the outcome of the evaluation will likely be flawed. This is why Role Plays are a necessary checkpoint. A scenario involves how a future event may result, based on a coherent and internally consistent set of assumptions and constraints through LL. Scenarios are important when considering a formative approach to LL. Scenarios are derived primarily through scientific or statistical projections (i.e., market conditions), but may rely on non-scientific criteria, i.e., feelings or hunches. Scenario analysis is a process of analyzing possible future events while considering alternative possible outcomes (scenarios). The analysis is designed to allow for improved decision-making by allowing consideration of outcomes and their implications. For manual non-complex processes, a decision tree is commonly used for scenario analysis. On the other hand, a DSS can be used to automate scenarios for complex requirements. Scenarios may utilize role-plays or similar methods to support active engagement. After reading directions below, click here to play online TELL PE board game. This image represents the LL electronic game board, which is composed of 32 squares. The player (contributor) rolls the dice and then moves their game piece around the board and contributes lessons based upon the card pulled from the deck. It is ideal for a half-day LL workshop and can take 1-3 hours to play. It has also been created as a physical board (available with my new book only and not sold separately). The physical board can be played in a hands-on mode. Cards: There are four decks of cards that coorespond to Process Groups, Knowledge Areas, Summative and Formative. As you land on that respective square, you pull a card from the deck. Game Piece Selector: Up to 10 contributors may play the game at what time. Upon exiting the game, a contributor may move their piece back into the game selector. Game Limit: Contributors determine at the beginning of the game what the duration will be in terms of number of lessons shared. Timer: Each contributor has three minutes per lesson. The timer is set to count down. Notepad: Thoughts and ideas shared during the session on lessons learned can be captured. Copy/Paste is enabled. Process Flow: This diagram illustrates a typical project lifecycle and integration of LL. There are a variety of circumstances where "What If" needs to be considered even though it may not have happened in the context of lessons learned.